David Beckham was amongst the crowd of celebrities who turned out for Muhammad Ali's funeral and memorial service. The former England football who is one of Muhammad Ali's biggest fans was seated with thousands who turned to honour the late boxing legend Muhammad Ali this Friday at the KFC Yum! center in Louisville, Kentucky. 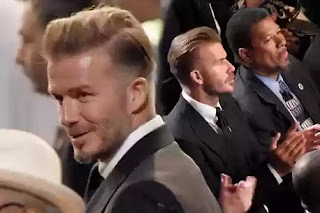 David Beckham was joined by a host of other famous faces like retired former heavyweight boxing champion of the world Lennox Lewis and A list Hollywood actor Will Smith. Will Smith later said he was stunned and humbled by the outpouring of love for Ali. Smith and Lewis along with Mike Tyson acted as pallbearers. Tyson who almost didn't attend because he was "too grief striken" had to later take an overnight flight just to be there to honour the boxing champ. Ex-US president Bill Clinton was also in attendance and have an eulogy. Clinton got emotional as he spoke about Ali. He said that Ali didn't let the Parkinson's he suffered for over 30 years destroy his gifts. Comedian Billy Crystal also spoke and made people laugh when he talked about his 42 year friendship with Ali. He said that Ali had a nickname for him "little brother"
He also said that he saw Ali as a "lightening Bolt"
"On the moment of impact, it lights up everything around it. "His intense light shined on America. We were able to see clearly injustice.... Ali forced us to take a look at ourselves"
"He is gone, but he will never die, he was my big brother." Actor and former governor of California Arnold Schwarzenegger was also present. Ali's wife Lonnie also spoke about her late husband. And Malcom X's Ambassador Shabazz daughter was present to give an emotional eulogy. According to Muhammad Ali's wishes, the Memorial ceremony was multi faith. With different faiths and religions represented forging a unity in diversity like never been seen before by one man's life or death.